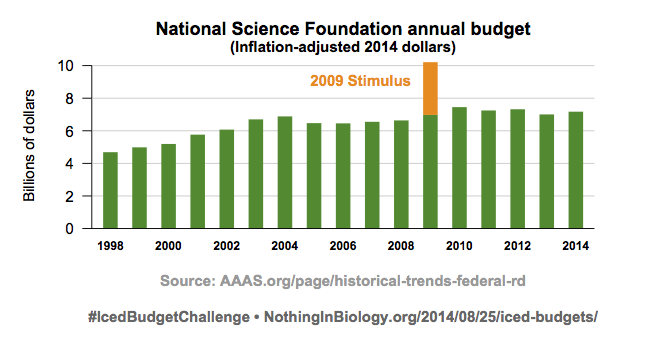 The #IceBucketChallenge, and iced-up budgets for scientific research [Updated] « Nothing in Biology Makes Sense! Graph by jby, data from AAAS. 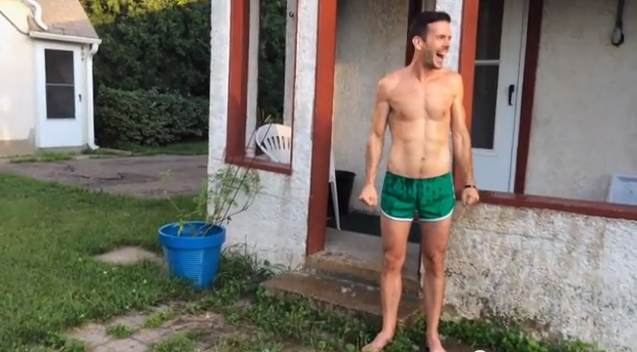 So when I took the ice bucket challenge, I added a twist: I’m challenging folks to call their elected representatives in Congress, and ask that our tax dollars go toward better funding for all scientific research. Call it the #IcedBudgetChallenge. You can e-mail or write an old-fashioned letter, of course, but phone calls have the advantage of getting more attention than just an e-mail, and being quick enough to do over a lunch break. You can find the phone numbers for your Congresspeople at House.gov, and your Senators at Senate.gov. You get bonus points if you can yell at your representatives for taking the ice bucket challenge themselves after voting to cut funding to NIH. One of my own calls is in my challenge video, below, to give some sense of what you might say, and how little time it really takes. 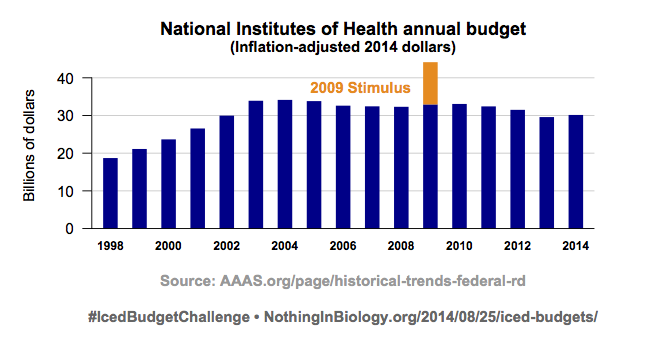 Update, 29 August: In the comments, Alex Williams points out that the Accelerate Biomedical Research Act, which would restore the NIH budget to inflation-adjusted 2003 levels, is under consideration in committee right now. It might be a good idea to mention that bill in your phone call! When you’ve made your calls, why not post about it with the #IcedBudgetChallenge hashtag? And tag some friends to make their own calls. If there’s one thing we can learn from the ice bucket challenge, it’s that a social campaign really can add up to something substantial—and an #IcedBudgetChallenge campaign for basic research funding could help people suffering from everything from ALS to cancer to MRSA. This entry was posted in funding, politics and tagged ALS, ice bucket challenge, iced budget challenge. This is great! I also emailed my Senators about the need for increased NIH funding for research on neurodegenerative diseases like ALS (which my grandmother had). I’m annoyed by people I see bashing this challenge as purely a fad, because as you noted it has raised a lot of money. But at the same time, I definitely agree that the bigger issue, which is largely being ignored, is that the government contributes the bulk of the funding for this research and it is being slashed. Love this idea. I was in fact thinking about making a similar video, and I still might. Also — you should know that there is currently a bill co-sponsored by Franken (the “Accelerate Biomedical Research Act”) that aims to restore the purchasing power of the NIH back to 2003 levels. So calls to congress are very timely. Everyone should mention this bill in their phone calls. P.S. the first step is for the bill to make it out of the senate budget committee. At least 7 of the 20 senators on that committee have taken the ice bucket challenge. Thanks, Alex! I wish I’d known about that bill from the start—having specific legislation to recommend is, I think, generally regarded as better.